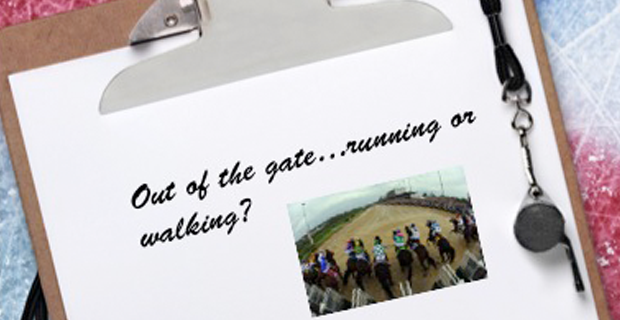 Deflections: Out of the Gate… Running or Walking? A vagary of the minor hockey schedule in my area had us not play our first game 'til Oct. 19. The last one of 30 will be Feb. 9. So 30 games in 100 days, with two weeks off t Christmas, more like a pro or junior schedule than one for 13- to 14-year-old entry level competitive kids. The late start created some interesting challenges I hadn’t faced before. Even in my bygone days of minor coaching, I can’t recall so many practices without a game—11 since our second of the two exhibition games we got spanked in. That was nearly a month ago. The kids were antsy, to say the least. Now I could say the many preseason practices were ideal for a good practice to game ratio or that we’d be extra prepared for the season opener because of them. The reality has been that the ratio will be shot to pieces with all the games crunched into a short time frame with little room for more practices. Plus, you can be too prepared and the kids are bored with practice. I can’t blame them. The challenge has been to come up with creative practices, particularly in the final few leading up to Game 1, that had competitive components and still accentuated key skills. Let’s face it: The boys still need to learn how to play the game and no amount of skill instruction and individual tactics will provide much more than a superficial notion of it. The balance then is in keeping them tuned to both the game and how to improve. I’d spent most of the last 25 years with junior or elite groups with different needs and a greater sense of immediacy for success. Here though my eyes are not on the next game prize but the end of season one. How much can I get these kids to improve by February? But I’ve been up against the one roadblock no coach can do anything about: Mother Nature. Kids who haven’t yet matured much physically, particularly true of our first year bantams, are having a tough time keeping up. They want to; they think the game well enough; they have a pretty good idea what to do and when. But often just can’t get there or succeed. It’s been obvious in drills and will become truer in games. This means my practices have to continue to provide them plenty of opportunities to work under a certain level of acceptable duress while still allowing them the chance to succeed. Not much point in doing drills or small area games where the benchmark is failure. Besides, once the season starts, coaching in games is far more difficult, quite unlike in junior where mid-period changes to strategy were commonplace. So how did we fare in game one?